The genre painting of the Dutch Golden Age between 1650 and 1675 ranks among the highest pinnacles of Western European art. The virtuosity of these works, as this book demonstrates, was achieved in part thanks to a vibrant artistic rivalry among numerous first-rate genre painters working in different cities across the Dutch Republic. They drew inspiration from each other’s painting, and then tried to surpass each other in technical prowess and aesthetic appeal. The Delft master Johannes Vermeer (1632–1675) is now the most renowned of these painters of everyday life. 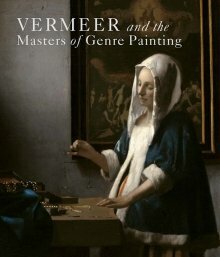 Though he is frequently portrayed as an enigmatic figure who worked largely in isolation, the essays here reveal that Vermeer’s subjects, compositions, and figure types in fact owe much to works by artists from other Dutch cities. Enlivened with 180 superb illustrations, Vermeer and the Masters of Genre Painting highlights the relationships – comparative and competitive – among Vermeer and his contemporaries, including Gerrit Dou, Gerard ter Borch, Jan Steen, Pieter de Hooch, Gabriel Metsu, and Frans van Mieris.